Neem leaves grow on the neem tree, Azadirachta indica, native to India and Southeast Asia. A fast growing evergreen and ornamental, its leaves are available for collection year round, except in times of severe drought or if the neem leaves are killed off by frost, notes the University of Michigan Health Center (UMHC). Neem leaves enjoy a long history of traditional medicinal use in Ayurvedic medicine from India. The leaf extract, according to information gathered by UMHC, is described as a natural remedy in ancient medical texts for diarrhea, skin ulcers, malaria, intestinal infections and problems with the gastrointestinal tract. The World Health Organization (WHO) says, “Neem leaves detoxify and purify the blood; help against eye disorders and insect bites.” It suggests a number of home remedies for neem leaves. Mix dried neem leaf powder in a 1-5 ratio with Vaseline for topical application to minor cuts and burns and to relieve itching. Add boiled neem leaves to your bathwater if your skin is itchy, and gargle with neem leaf water mixed with honey for a sore throat. Chew a few neem leaves as part of your regular herbal supplement routine to purify the blood and help with diabetes. 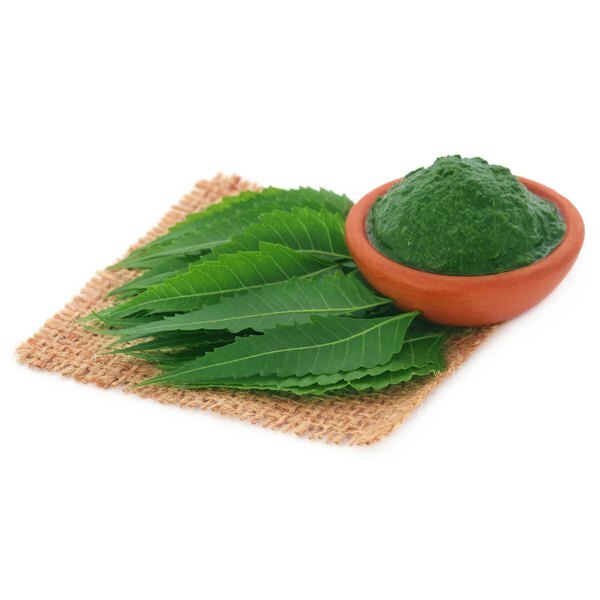 Neem leaf extract is found in toothpaste and also in topically applied creams intended to fight infections. The substance found in neem leaves and all other parts of the neem tree used in commercial pesticides is called azadirachin. According to the Department of Horticulture at the University of Connecticut, the pesticide derived from neem leaves has low toxicity to animals and biodegrades quickly. In India, farmers hang branches of the neem tree in their granaries to keep out insects. University of Connecticut explains it acts as a feeding deterrent, kills some soft-bodied insects on contact and disrupts the molting process, preventing the immature larvae from becoming adults. The University of Michigan Health Center warns that neem leaves and neem leaf extracts “appear to be very safe at recommended intake levels with no significant reports of problems.” The oil pressed from the seed of the neem tree is more potent than the leaves and contains the most concentrated amounts of the active compounds. UMHC recommends that neem seed oil should be kept out of the reach of children. It may cause an upset stomach, diarrhea or nausea. The WHO points out some people should avoid using neem leaves. It advises pregnant women or those trying to conceive to steer clear of neem because of its traditional use to prevent conception. Additionally, do not use neem leaves on a child with a fever or apply neem products close to or on your mucous membranes.